The city of Nottingham is about to become the first in the UK to have its own ‘Eco-Expressway’, which aims to significantly improve public transport connections into and out of the central area, as well as reduce the temptation for people to use their cars in congested areas. But what does the £6.1 million scheme mean for operators, and how will it benefit both bus companies and passengers? 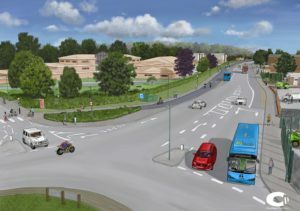 According to the official documents, The Eco-Expressway is a scheme to promote sustainable travel along an east-west corridor serving new and proposed employment and residential sites across the city of Nottingham. It will offer sustainable transport options and support new development growth sites with improvements to bus services, new cycle facilities and the promotion of the use of Ultra Low Emission Vehicles (ULEVS). The Expressway will feature an electric bus route that will run on a high capacity, high frequency bus corridor running between to and from the city centre and six miles out of town to the suburb of Colwick, funded by the Derbyshire and Nottinghamshire Local Enterprise Partnership. This will build on the city’s already bustling tram network and existing 45-strong fleet of electric buses, the most recent batch of which were inaugurated last week. The man responsible for overseeing the Eco-Expressway two-year project is Paul Horn, Team Leader for Public Transport Projects at Nottingham City Council. According to Horn, the Eco-Expressway aims to reduce emissions by up to 200 tonnes of CO2 and 27kg of NOx over a year, largely thanks to the adoption of electric buses that will run along the route. The corridor will be 19.2 metres wide, and will see foot passengers, cyclists, EVs and buses all sharing the same space. The width of the Eco Expressway ensures that all those using it have ample room to stay safe and reduces the risk of accidents. There are three phases of the project, which could, in the future, be used as a blueprint for similar schemes to be created up and down the country. Construction of the first phase is already underway (it began in October 2016) and when opened, will see about half of the total six miles created specifically as priority bus lanes. Phase 2 will consist of developing a new bus lane on Vale Road, which currently isn’t open to ULEVs. 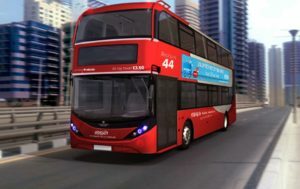 The third and final phase in the development will include physical measures to the west of the City including proposed extensions to bus lanes along Queens Drive and Thane Road and new routing options for the Eastern Section including a proposal to run buses through the Island development site. In addition to the electric buses, Horn says that gas-powered buses, ensuring vehicles with the lowest emissions are used. The two vehicles to initially be used on the route will be BYD 12m single deck buses. Each vehicle has two battery packs, which enable a full service operation under one charge. Overnight charging at reduced electricity rates takes less than five hours, ensuring the operational costs can be kept as low as possible. Whereas there is currently a free bus service that caters to part of the route, the proposal will mean easier access for a greater number of residents and a more user-friendly bus service is provided. Services will start from the Victoria Retail Park at 6am and run at regular intervals – generally as often as every 10 minutes – until after 7:30pm. The park and ride area has been expanded to accommodate up to 1,000 vehicles and a purpose-built electric charging depot is planned at the terminus. As the use of electric buses becomes more widespread – and the infrastructure to service and support them continues to grow – it is likely that more shared spaces such as the example seen in Nottingham will appear. As an added incentive for local residents and business to invest in cleaner vehicles, electric cars, taxis and vans will have privileges that will allow them to use the bus lane along the route. The concession to allow EVs to run alongside passenger transport will potentially benefit centrally-based businesses, as EV deliveries will be much quicker and more efficient than driving into the city in a diesel-powered van. Vehicles on the Expressway will all be monitored with the use of Automatic Number Plate Recognition systems (ANPR), ensuring that any vehicles that aren’t complaint with the emissions requirements are highlighted and controlled. Other urban areas across Britain will be watching Nottingham’s progress carefully, as the Eco-Expressway is a model that could well be rolled out nationwide as the UK’s EV infrastructure continues to grow and vehicle technology advances.